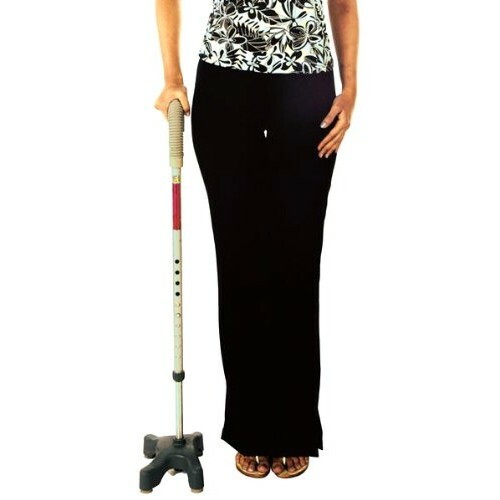 Quadripod is provided with four durable legs on the bottom instead of only 1, this Quad Base Walking Stick provides exceptional stability however with the convenience of a one-handed walking stick. Every leg of the walking stick is tipped with a non-marking, slip-resistant rubber cap and also the ergonomically formed handle ensures a secure grip in the least times. 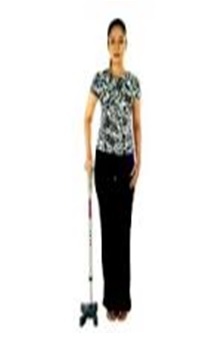 The sticks height may be raised or lowered to suit the user's size and posture. It can be used if you are suffering from impairment of balance, any kind of Walking Disorders, Leg Injury or disorder of Stroke spike Chronic osteoarthritis of the knee. Q	Is the product easy to use? Q	Can it be used on marble surface? ANS	Yes, it can be used on the marble surface and it wont slip. Q	Is the height of the product adjustable? ANS	Yes, you can adjust the height. Q	In how many sizes is the product available? ANS	It is available in two sizes which are Universal Adult and Universal Child. Q	Does it provide anti-slip pods? Q	What is the maximum load bearing capacity ? Adjust the size according to your height. Special Feature Quadripod walking stick provides you four legs instead of only one which makes it Slip resistant and secure.